Are you prone to a problem with 'Wheat Intolerance'? A wheat intolerance is an inability to digest wheat. A gluten allergy is slightly different. Gluten is a protein molecule found in wheat and some other grass family foods (such as barley). A gluten allergy means that your immune system attacks the gluten in the small intestine after you ingest it. 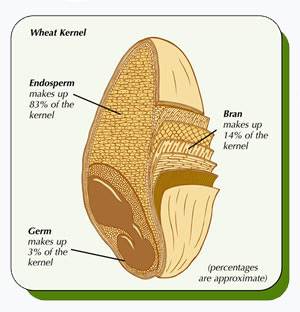 People with a wheat intolerance can often eat a tablespoon or two of wheat without symptoms. People with wheat allergies will experience symptoms even after small doses of wheat. Disclaimer: Conditions such as 'Wheat Intolerance' that cause tissue changes could be serious and should be checked by a medical doctor. Augment your diet with these specially chosen ingredients below which may be useful for 'Wheat Intolerance'. Individual results vary depending the cause of your imbalance and by constitution. Please research the ingredients below to find which are most helpful for you, and check with your doctor before making any changes to your health and wellness routine. HOW DOES AYURVEDA HEAL 'WHEAT INTOLERANCE'? With Wheat Intolerance, one or more of the following doshas and qualities may be aggravated. If you have an imbalance of one of these doshas or qualities, Ayurveda recommends avoiding foods and lifestyle habits that aggravate that quality and/or dosha. These imbalanced doshas and qualities may need to be brought back into balance before this condition can be healed. Click on the quality to learn what foods and lifestyle habits should be avoided. The following symptoms & habits may be related to 'Wheat Intolerance'. See your quiz results for a computerized assessment of your body type. Please click on the symptoms below to learn more about them. How does 'wheat intolerance' affect your quality of life? What aggravates it? What has helped you? Is there something you'd like to know about 'wheat intolerance'?